For all involved it was an unprecedented series of events. A foreign journalist in Darfur, present as a special envoy by the government of Slovenia had been captured after months living rough with the rebel militias. Now he was shackled in a courthouse, awaiting trial on charges of espionage and ‘bad-mouthing’ the government of Sudan. 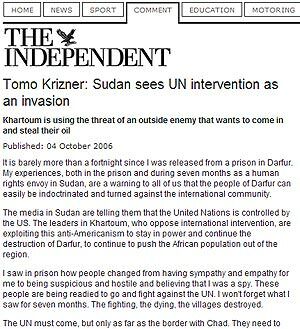 Tomo Kriznar, a prominent human rights activist and passionate advocate for the voiceless of Sudan, had spent a month in a North Darfur prison, defending himself against accusations that hung heavy over the heads of the national and international media in Sudan. Tomo’s story was one of righteous misadventure. He had started in Chad, meeting with rebel leaders not represented in the Abuja peace talks. He then drifted across the border that divided Chad from Sudan, and into what he considered a ‘liberated area’. In Darfur, Tomo met with senior representatives of the Mini Minawi rebel leadership (the only rebel group to sign the Darfur Peace Agreement), and in the afterglow of the Abuja signing began a journey into the rebel heartland in an effort, "to photograph the everyday life and basic humanitarian situation in SLA controlled land." As fighting escalated between rival groups, Tomo ventured to the opposing rebel side of Commander Abdul Wahid. After several months ensconced in rebel territory, he sought a passage back west through Chad. Unfortunately, his plans for retreat led him through African Union forces and into the hands of Sudanese military intelligence. With more than 5,000 photos cached and an invalid visa, Tomo, despite his protestations, was paraded as a spy threatening the stability of the country. Incredibly, these same charges were levelled at Pulitzer Prize winning journalist Paul Salopek, who was arrested by Government-allied militias in Darfur less than one month later. Tomo received a two year custodial sentence, and though this was subsequently quashed after international pressure extracted a Presidential pardon, it was nevertheless a stern warning from the judiciary to dissenting journalists to turn their heads, even as the violence in Darfur continues. Credible estimates put the death toll in Darfur at close to 400,000 people, including conflict-related deaths and those who have perished through disease and displacement. Such a figure jars heavily with President Bashir’s most recent assessment that less than 10,000 people had been killed in Darfur. Bashir’s figure is symptomatic of Khartoum’s desire to lie about the true extent of the country’s numerous conflicts. Inside Sudan there is a reticence to recognise the depths of the conflict, with much left unseen and unsaid. Since the signing of the Comprehensive Peace Agreement (CPA) between the northern Muslim government and the Christian/Animist south, media censorship laws have been repealed and re-instated on a number of occasions. Although the National Interim Constitution enshrines the right to, "…freedom of expression, reception of information, publication and access to the press without prejudice", in practice, this has meant that the local media, particularly daily newspapers, remain subject to regular harassment by Government security forces. More often than not, police cases are filed without referral to the Journalists Union, effectively removing any accountability or right to intercession before cases are brought before the courts. Strong-arm tactics are entrenched in the government’s media and information laws. The government-controlled National Press Council, the arbiter of press content in Sudan, has instituted rigorous conditions for publications to adhere to, including proofreading by security forces, stringent testing for journalists and the authority to blacklist media outlets if their content is deemed to be inflammatory or insulting to the government, the country or the President. The government’s refusal to allow-UN mandated peacekeepers to deploy in Darfur has also led to a tightening of control on the media. 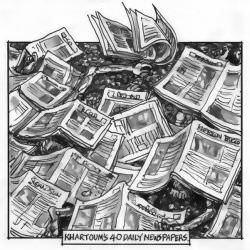 ‘Mohammed’, a journalist with an independent newspaper in Khartoum believes that while the Interim Constitution should uphold journalistic freedoms to the fullest extent possible, many journalists, principally those not allied with the government, remain a target for victimisation. He notes that of nearly 40 newspapers published daily in Khartoum, only 17 focus primarily on political news and of those, 12-13 have direct links to Government security forces. According to Mohammed, only three or four independent newspapers regularly report on events in Darfur, a region that remains mired in conflict. Furthermore, Sudanese journalists now rarely travel to Darfur, due to fear of recriminations when they return to Khartoum. Similarly, the international media are rarely afforded opportunities to travel to Darfur owing to stringent travel restrictions imposed by the government. This ‘pre-emptive’ suppression has meant that many of the atrocities in Darfur have unfolded without being reported in local media. Sudanese journalists have many more battles to fight against censorship. The current trend of persecuting dissenting journalists does not augur well for the future, particularly as both constitutional reform and the peace process depend upon open and unfettered dialogue. ‘Mohammed’, for one, remains hopeful though that ‘Newspapers have a good future because people trust in their articles’. One can only hope that this trust is fully repaid in voice, and in print.